The Blur vs. 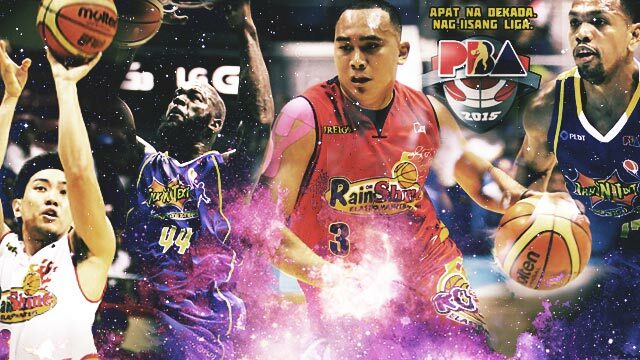 The Lee-thal Weapon, Beau's elbows vs. Ranidel's <em>gulang</em> moves, Norwood vs. Rosser: It's going to be a fun PBA Finals series! The PBA Commissioner's Cup Semifinals was done faster than we can download leaked episodes of Game of Thrones. The two best-of-five matchups were over in a combined seven games as the Rain Or Shine Elasto Painters and the Talk 'N Text Tropang Texters each won three straight games (the latter after losing their first game against the defending champs, the Purefoods Star Hotshots). With Marc Pingris and Co. dethroned, ROS and TNT are left to battle it out in the grand finale, the Commissioner's Cup Finals. It's worth noting that since Rain Or Shine won their first franchise title in the 2012 Governor’s Cup, they have not been able to beat Talk 'N Text in a playoffs series. In their two postseason meetings since the said championship, the Tropang Texters swept the Elasto Painters in the 2013 Philippine Cup Finals and swept them again in last year’s Commissioner’s Cup Semifinals. Kontrapelo much? The Tropang Texters are looking to cap off their first full conference without Jimmy Alapag with another title. The Elastopainters, meanwhile, are looking to solve the puzzle that is Talk 'N Text, and you can bet your next paycheck that they're as hungry as a pack of starved dogs. Just how will this series go and who will bring home the proverbial bacon (or crispy pata because #ExtraRiceInc)? Oh we don't know, but we consulted the shiniest bald head of our barangay to look into the future and check out the things that might happen in this series. Read on for our predictions! Eight players from the Gilas team that competed in the 2014 FIBA World Basketball Championship will be in the finals. Jeff Chan, Paul Lee, and Gabe Norwood, as well as Gilas reserve Beau Belga will suit up for Rain or Shine while Jayson Castro, Ranidel de Ocampo, Larry Fonacier, and team manager Jimmy Alapag will be on the side of Talk 'N Text. While they went into fierce battles together, their Gilas brotherhood will be on pause when the opening whistle blows. There may not be genuine hatred between the two teams, but that doesn’t mean they won’t be on each other’s faces come gametime. Castro had eight threes in Game 3 and 33 points in Game 4 of their semis dance against Purefoods. He’s doing his best Steph Curry impersonation in a team filled with scoring weapons. Against Rain or Shine, he’ll be facing a squad chock-full of players who can drain the three as well. The prime candidates are Paul Lee and Jeff Chan, but don’t be surprised if someone like Ryan Araña or Jonathan Uyloan suddenly comes out of nowhere to rival Castro's sniping prowess. Together with Castro, Lee is a frontrunner to finish with the Best Player of the Conference plum. The "Angas ng Tondo" is playing with a team-leading player efficiency rating of 34.5678 for this conference, good for fifth overall in the league. The "Angas" factor was earned because of his penchant for taking big-balls shots and he will no doubt fire away in this series. It may come in a shootout with Castro or de Ocampo, or it may come in bunches as the Elastopainters are closing out the Tropang Texters. Paul Lee will Paul Lee it up when it matters most. Rain Or Shine is known for defensive stoppers who can get a player off his game. However, Talk 'N Text also have a player who does D for them. Expect Aaron "Triple A" Aban to be unleashed on the Elasto Painters’ hottest player in the game as he tries his best Big Beau impersonation before the real deal knocks him down with a solid pick. ROS should keep their eyes on him on defense as he can also score, as proven by his 17 points in TNT's Game 3 semis victory over Purefoods where he played the "Magic Bunot" role to the hilt. Uyloan, who usually plays spot minutes for the Elastopainters (or when Coach Yeng decides to rest some of his players), actually played significant minutes for Rain Or Shine in the semis (18 minutes and 7.67 points per game). He’s not just a sideshow, he’s one of Coach Yeng Guiao's surprise packages from the bench. He can shoot the three, slash, and play in-yo'-face D—three reasons why we're expecting him to be a constant fixture on the court in the Finals. Rain Or Shine's import Chism wears his headband incredibly high on his forehead. In what will no doubt be a physical series filled with whacks and gulang moves, that headband is bound to come flying off during at least one of the games. When it does, the Tropang Texters better hope that he doesn’t get the same powers LeBron James did when The King lost his headband in Game 6 of the 2013 NBA Finals (where he took over in the fourth quarter). The former Letran Knights teammates will now play on opposite sides of the court. The Elasto Painters actually drafted both Almazan (2013 PBA Draft) and Alas (2014 PBA Draft) but traded the latter later on as they already had an abundance of guards in their roster. The Tropang Texters, meanwhile, pounced on the opportunity to snag the high-scoring rookie to bolster their aging lineup. These two will eventually find themselves in the shaded lane, with Alas attacking and Almazan defending, and will not reminisce about the good times they had in college. This is almost not a prediction; IT happens every game since he was in college! It doesn’t matter what team you cheer for—your girlfriend (or wife) who you dragged to the game / forced to watch the game on TV will most definitely shriek every time Tiu is put on the spotlight. He’s not too bad of a player himself, so he will get his close-up at least once when he’s in the game (and maybe even when he's burning a hole on a chair in the bench). The bigger question is will we see him "Tiu-torize" anyone from the TNT crew? Ganuelas-Rosser is a younger Norwood. Both are good defenders (Norwood could even be considered world-class) and both are known for their athletic prowess. In his rookie year, MGR has already produced some of the best in-game dunks in the tournament, earning him a spot at the dunk contest during the 2015 PBA All-Star Weekend. As for Norwood, you can ask Luis Scola just how high the dude can go. In a team that looks like there’s a minimum quota of rice intake, Norwood seems to have given away his share (Lee might be a beneficiary) to stay light and athletic enough to go up high for dunks. Get your scorecards ready, these two will get us off our seats at least one time in this series. Oh yes we're calling it! Hear us out first: Though it almost seems impossible for Coach Yeng to not have a technical foul in a series, we think he can manage to finish the Finals without one. He’s been pretty Zen against the Tropang Texters, even during last year’s Commissioner's Cup Semifinals sweep. Besides, he’s already had two refs suspended during their lopsided series win against the Meralco Bolts. The refs know they shouldn’t piss off Coach Yeng. But hey, there’s always the possibility of a post-game rant. Okay, okay, maybe one T since emotions will definitely run high. But more than one? Nah. All eyes will be on Castro after his scintillating semis performance against Purefoods. However, the Tropang Texters are loaded with other scorers who can explode at any time. Jay Washington, Fonacier, Alas, de Ocampo, and even Kelly Williams can go off at any time and post 20 or more points. They also have an import who averages almost 30 points a game this conference (29.73 to be exact) and has legitimate NBA experience. The Elastopainters have great defensive stoppers, but we reckon TNT is just too good offensively to be locked down for an entire seven-game series. If they hit their stride, getting to 120 points in 48 minutes is not a far-fetched prediction.